What with SARS, anthrax and other similar concerns, threats to the public health have been prominent in the news over the last few years. Understandably, few things freak out people quite like the possibility of highly contagious diseases. Modern flicks like Outbreak explored these concerns, but they don’t delve into a truly modern topic as I discovered when I watched 1950’s Panic in the Streets. Set in New Orleans, we see a card game run by a gangster named Blackie (Walter Jack Palance). Another player named Kochak (Lewis Charles) takes badly ill and leaves, but Blackie wants the money he lost so sends his goons to get it. One of them ends up shooting Kochak and they then dump his corpse in the river. Authorities find the body and take it to the morgue for autopsy. Coroner Kleber (George Ehmig) gets concerned when he examines the body, so he contacts Dr. Clinton Reed (Richard Widmark) of the US Public Health Service. Reed doesn’t like what he sees so he insists they immediately cremate the body and inoculate anyone who came into contact with the corpse. Reed also alerts the authorities that Kochak might have carried pneumonic plague and he warns them that they need to find anyone who encountered the dead dude within 48 hours. This means they need to track down the killer of a John Doe in two days, and that sounds like a nearly impossible task. Reed gets partnered with cop Captain Tom Warren (Paul Douglas) to work on the case. The two aren’t wild about each other as Warren thinks it’s a futile quest. The rest of the movie follows the investigation and their attempt to head off a serious public health issue. While Outbreak turned plague into action/adventure, Panic manages to make a film noir out of the subject. Actually, it feels like part crime story and part thriller as we nervously await the potential spread of the disease. The incubation period acts as the movie’s ticking clock to add urgency to the affair. To be sure, Panic offers a good premise, which is probably why we’ve seen others follow the same path since then. While it relies on some genre conventions, it takes more than a few clever turns along the way. Among those is the buddy element. We’ve seen enough movies to know that eventually Reed and Warren will develop mutual respect for each other after their initial bickering, but that doesn’t make the theme less effective here. It helps that we see good chemistry between Widmark and Douglas. They crackle against each other since they’re both pretty tough, and it feels like true antagonism, not the usual cutesy stuff. Widmark definitely creates a different kind of lead character. He makes for a quirky protagonist due to his gruff demeanor. What kind of bedside manner must this doctor have? He always acts like he’s about to punch somebody. That might be awkward in real life, but it works for the film. Tight and tense, Panic in the Streets creates a solid race against time. With its lively characters and a clever idea, it manages to turn into something consistently involving and unusual. 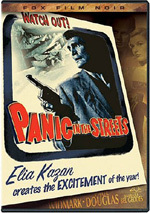 Panic in the Streets appears in an aspect ratio of 1.33:1 on this single-sided, single-layered DVD; due to those dimensions, the image has not been enhanced for 16X9 televisions. Sporadic problems occurred, but much of the film looked great. The main issue connected to edge enhancement. Moderate haloes popped up during parts of the movie, and they made the image less distinctive than I’d like. Usually sharpness appeared nicely tight and distinctive, but the edge enhancement led to slightly weaker definition in some wide shots. No issues with shimmering or jagged edges occurred. Despite the film’s advanced age, source flaws were quite minor. Periodic examples of specks and marks showed up, but they weren’t frequent intrusions. Contrast was terrific, as the movie consistently maintained a nicely silver tone. Blacks were deep and firm, while shadows were smooth and well-defined. Much of Panic looked good enough to reach “A” level, but between the smattering of print defects and the annoying edge enhancement, this one fell to a still-positive “B”. The folks at Fox love to saddle their classic movies with stereo remixes, many of which aren’t very good. The stereo track for Panic in the Streets wasn’t one of the crummiest of these presentations, but it showed some of the problems typical of their redone audio. Though they called it stereo, Panic really stayed monaural. The movie demonstrated a broad form of reverberation that spread the material slightly to the sides, but there was no distinctive delineation anywhere other than in the center. The mix showed vague blending to the sides and that was it, as the mix didn’t give us real stereo imaging. As usual, the remix added an echo to the speech that altered intelligibility. Actually, this was where the track didn’t suffer as bad as many Fox stereo remixes. Despite the unnecessary reverberation, the lines remained intelligible; they just weren’t natural or concise much of the time. Music seemed acceptably bright and lively, though some of the reverb created a tinny tone there as well. Finally, effects were decent but without much dimensionality. They came across as a bit flat and lifeless. This was a mediocre remix that lacked the force and definition I’d expect. While not one of the most problematic stereo tracks I’ve heard, I’d recommend that you stick with the original monaural version instead; it’s significantly clearer and more natural. As for extras, we get an audio commentary from authors/historians Alain Silver and James Ursini. Both men sit together for this running, screen-specific chat. They cover the film’s place in director Elia Kazan’s career, its visual style and how it fits within the noir genre, casting and the actors, improvisation, locations and casting, and various facets of the production. 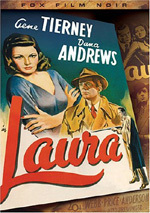 Ursini and Silver go over a number of good topics, especially since they often refer to the film within its historical perspective. That’s a positive and a negative. While we get a nice feel for how Panic fits in Kazan’s career and other connected elements, we don’t learn a ton about its making. I guess I’m used to thorough Rudy Behlmer-style tracks that cover everything under the sun, while this one lacks that level of preparation. It comes across as more impromptu than I’d like; I think commentaries from historians require a higher level of detail than what we find here. It’s definitely informative and worth a listen, but it doesn’t stand out as particularly terrific. In addition, we get some trailers. 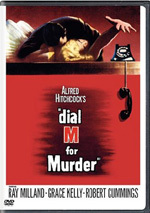 The disc presents an ad for Panic itself as well as four others under the “Fox Noir” banner. That area includes promos for Laura, House of Bamboo, Call Northside 777 and The Street with No Name. A film noir with a theme that remains timely, Panic in the Streets eschews the usual “hunt for a killer” topic. Sure, it does look for a baddie, but with a clever backdrop that makes matters more compelling. This adds up to a tight little drama. The DVD features pretty good picture with mediocre audio and an erratic but generally useful commentary. Especially with a low list price of less than $15, Panic deserves a look.